Problems viewing this email? Click here to view in browser. We hope you are enjoying your trial access to Technical Analysis of STOCKS & COMMODITIES and Traders.com. Please let us know if you have any questions. Why STOCKS & COMMODITIES Magazine? Technical Analysis of STOCKS & COMMODITIES, The Traders' Magazine, is the magazine for traders — and traders-to-be — who want to play the markets with a concrete game plan. 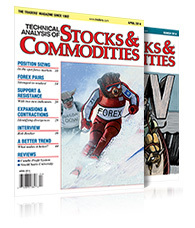 Every issue of STOCKS & COMMODITIES brings you the latest, most detailed information on trading strategies, charting patterns, indicators, and computerized trading methods. And you’ll get it from the people who know what it’s like to sweat out a position in the pits or in front of the computer. The Editors and Staff of Technical Analysis, Inc. If you have received this email in error, or prefer not to recieve future mailings from us, please click here to unsubscribe.